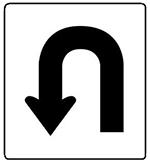 The fact that U-Turns are so common in the U.S. makes traffic a lot easier. You missed to take a turn a second ago? No problem! Just drive to the next intersection and make a U-Turn. Fortunately it usually doesn’t take long to get your next chance, so you can correct your mistake without wasting a lot of extra time in traffic. You will also not confuse other drivers by making this 180 degree move, because they all do it. Love it!! This is probably the best invention! After stopping at a red light, you get to make a left turn while the signal is still red. No need to wait until it switches to green. Huge time saver! Just make sure that it’s clear before you enter the intersection. Some intersections however, do not want you to practise this. There are signs that’ll say “No Red Turn On Red” if that’s the case. In many countries passing on the right side is prohibited and if you still dare to do it you will earn the outrage of the other drivers. 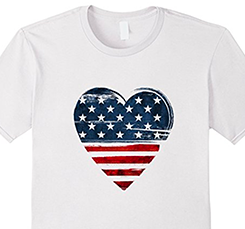 In the USA, the land of the free, all this doesn’t matter. You’re free to pass on either side, which makes driving a lot more fun, especially if you have a slow driver in front of you on a road with multiple lanes. No need to harrass this driver with constant blinking, flashing lights or even honking like some Germans do it on the Autobahn. Mentioned already in the previous paragraph, multiple lanes are a blessing and allow you to get through traffic just a little faster with less stress. And you can also drive slalom like the guys in the movies. Just make sure to look around you, because other drivers like to drive slalom and pass on either side too. Watch out for the aggressive drivers who switch lanes in a very hectic manner! 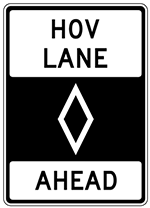 The carpool lane, also called the HOV lane (High Occupancy Vehicle), is only to be used by cars with 2 or more people in the vehicle (driver included). It’s supposed to encourage people to share a ride and reduce the amount of cars on the road and therefore avoid traffic jams. Great invention! Sometimes they are even separated from the main road. My neck is really grateful for the smart placement of traffic lights here in America. Instead of being right at the white line on your side of the intersection it’s on the opposite side allowing everybody a comfortable view of the signal. If you’re first in line at a traffic light in Europe, you would have to twist your neck in order to see the signal. The signals in the United States are also higher up, which makes it even easier to see for drivers farther back in the line. I really miss the Autobahn, which doesn’t have a speed limit for the most part. 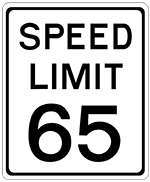 But then I also appreciate that there is a speed limit on U.S. Interstates. It’s a lot less stressful, when everybody is driving a similar speed and you don’t constantly have to look in the mirror for race car drivers, who will blow you off the road, because they are driving double the speed of yours (German Autobahn). Americans love big cars! 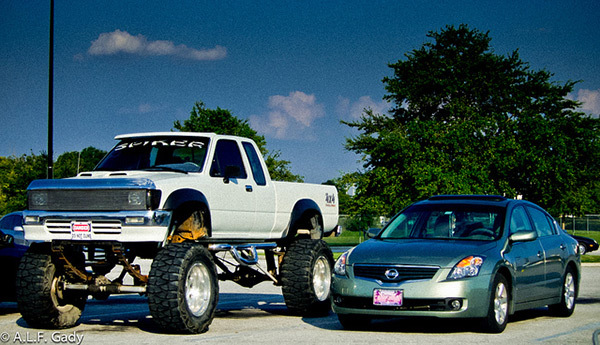 SUVs, pickup trucks and if this is not tall enough, they customize their cars to make them even taller. It seems like every configuration is allowed here. Except Monster Trucks I think I have seen pretty much everything on the road so far. The problem with all these tall cars is that they are totally blocking the view or the car behind them. If you like to see what’s going on 300 feet ahead of you, forget it! These huge cars don’t make this possible, unless you keep moving from left to right on your lane. Nothing scares me more in traffic than these maniac drivers in huge trucks and freightliners. They are the, by far, worst speeders on the road. It makes it even worse when they are sleepy and speeding. If you have ever seen how a regular car can be squeezed to a cardboard box when it gets in between two trucks in an accident, you may want to keep a huge distance to these trucks for your own safety. I wish the state troopers would pull over more trucks than other vehicles, because these speeding heavyweights are deadly. Speaking of state troopers, in certain regions they can be all over you. Especially if the state needs more money. They are equipped with radar, laser guns in some cases, and they are either following you in traffic or hiding on the side of the road behind bushes or on top of bridges. Then, if you happen to drive more than the speed limit and they catch you, they’re going to chase you down and pull you over. Sometimes this can be very annoying when the speed limit gets reduced to 55 mph on the interstate and they are just waiting for you to go over. 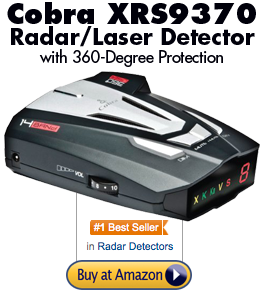 A way to avoid the troopers is to buy a radar detector, that will warn you before they set their eyes on you. Here’s the one that I bought* a while ago and I love it. Never lets me down. This is something Americans still have way to improve. Instead of endless intersections with traffic lights, that just slow down traffic, making it a pain to get to and from work during rush hour, they should build a lot more circles. Some cities are already experimenting with it and I definitely see progress with circles in Charlotte, but it would make sense to have a lot more of these. Circles also reduce the risk of accidents. And most of all, people don’t get the chance to stop and look at their phone that much, because a circle keeps everybody moving. I know, I just mentioned that I love the Speed Limit, but I also hate it. This is because I got spoiled for 27 years of my life with the German Autobahn, which allows you to travel almost at the speed of light. I don’t like spending time in traffic, and although having a speed limit in place takes off the stress of driving, it’ll sure be nice if I could cut down my drive to the beach from 3 to 2 hours. This usually happens to me, when I’m already late for work and I take my daily shortcut through an industrial area in Charlotte, that has a spider web of railroad tracks. The problem with trains in America is, that they are just unbelievable long… and slow! You feel like you’re losing a lifetime when you’re watching the wagons pass by and it just doesn’t seem to ever come to an end. I’ve turned around many times and happily took a detour, just to not go insane and losing more time of my life in traffic. The other thing with trains in the U.S. is their eardrum bursting horn. And the train drivers must really love playing with it, because they go crazy honking the horn whenever they approach a railroad crossing. This is mainly due to safety, because most railroad crossings don’t have gates. So they have to let traffic know that they’re coming. I pity the poor homeowners, who didn’t know a railroad crossing is nearby when they bought their house. In Germany, trains don’t honk. If you’ve been driving here for a week, you already know what I’m talking about. There are old tires, leftovers of tires and all kinds of junk sitting in the middle of the road. Some Americans seem to drive their tires until they literally fall off. Same with junk that usually falls off pickup trucks. I’ve seen folding chairs, wooden planks, garbage bags, etc. on the Interstate. And if you have a tall car in front of you, you probably don’t have enough time to go around the junk on the road. It’s not unlikely that you will damage your car when you hit some objects like complete tires. 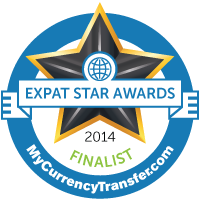 Get USA expat & travel tips right into your inbox! Sign up to receive my e-mail newsletter and get my free USA Tipping Guide! Great reference for new expats!